Fishing Fort Morgan is a fantastic way to spend your time. Fish are biting year ‘round in the waters just off the Fort Morgan Peninsula. Bon Secour, Mobile Bay, The Gulf of Mexico and Dixey Bar hold fish and Captain DeJuna Tedder at Gulf Adventures Fishing knows how to catch them. Captain Tedder has fished the Fort Morgan area for over 35 years, 13 years as a charter captain. He’s on the water most every day. He knows what fish are in the area, what bait is in the area, the tides and best times to catch the fish. While fishing Fort Morgan you will catch a variety of fish that fight hard and taste good. When people think of fishing Fort Morgan the first thought is red fish. Fort Morgan and especially Dixey Bar are world famous for red fish. It is not uncommon to catch 30 pound red fish with lengths of 3 feet. These red fish are known locally as Bull Reds and every fisherman enjoys their encounter with a bull red. Speckled trout are among the most sought after fish by locals and visitor alike. Speckled Trout (Spotted Sea Trout) are voracious feeders often knocking the bait out of the water with their attack. Specks will give a good fight for a short time before tiring, making their way to the boat and ice chest, and later the frying pan. Speckled trout is a great meal. There are many ways to cook speckled trout and I haven’t tasted a recipe that failed. Fishing Fort Morgan in the Gulf of Mexico will likely produce mackerel. It may be King Mackerel or Spanish Mackerel, both are prized and tasty fish. King Mackerels can be large 30 pound fish that will give an angler quite a fight. The mackerel steaks you’ll have later in the evening make the fight all that more enjoyable. Spanish mackerel are smaller but very tasty in their own right. Different times of the year produce different types of fish at Fort Morgan. Other fish you may encounter include flounder, sheepshead, black fish, white trout, cobia, mahi-mahi (dolphin), pompano, and others. 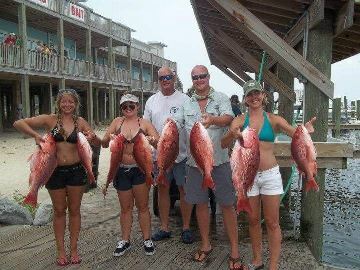 Fort Morgan Fishing includes RED SNAPPER when in season. Red Snapper is one of the most sought after fish along the Gulf Coast. Their flakey white meat is a table favorite in homes and restaurants. Captain Tedder knows so many reefs that hold red snapper that is it is almost impossible to go and not catch your red snapper limit.